Very large big kid playground: Oh my goodness, I can’t say enough…basically imagine some ramps that lead up to a pirate ship that lead up to a three-story tree house. There are two mega huge slides (I’m talking the largest I have seen ITP at playground!!) that you gain access to by climbing up three flights of ladders. There is a pirate ship type pretend area with ladders, ropes, steering walls, interactive walls, and more slides. Also, there are separate swings (5 big kid swings and one special needs swing). One thing to note is that there is a bathroom directly adjacent to the playground area. And a water fountain! Surrounding Park Area: Wow!! Community garden, 5 tennis courts, dog park, walking trails. Did I mention that the library is basically on site as well? Awesome! Shade: While the actual playground has no shade from trees or shaded structures, the actual playground, particularly the big kid playground, has a lot of shaded areas. The three-story structure – all shaded. Several awnings supply more shade. You can play underneath the “pirate ship” – all shaded. There are multiple shaded picnic tables, as well as a very large pavilion that is shaded. Stroller/Wheelchair Access: Yes. The actual big kid playground even has ramps where somebody in a wheelchair could possibly come up and play, too! Safety: Well, amazing as this playground is, there are a couple of things that are weird. If you imagine ladders (regular ladders) that you can climb up to get to the playground structure – imagine your kid climbing those and then the top rung is gone (purposefully). My poor short kid couldn’t get up on the play structure because a rung was basically gone – and it was designed that way! Also, the three-story structure. It’s awesome. But, imagine a very busy Saturday morning in April – the weather is beautiful – and the playground is packed. Some kid is bound to get spooked or kicked or pushed and it’s just not good in my mind. The only way down is down the super duper tall slides or down the way you came up. Also, the mulch is black. I’ve always had a hard time with the dark rubber mulch that so many of the new playgrounds use. The sun is so bright and it’s like the warmth it puts out just radiates up and makes everything 10 degrees hotter. Cons: I’ve addressed some of my concerns above in the “safety” section. Also, in the big kid section, there are no baby swings. I get it, it’s a big kid section, but I have a baby and a big kid. Where am I going to put my baby? Overall Assessment: Amazing! 5 stars! This playground opened in March 2011 and it is an absolutely wonderful addition to the playgrounds in Atlanta. The hope is that this playground will become a focal point and connect to other play areas and neighborhoods using trails. The PATH trail is supposed to connect Mason Mill Park to Medlock Park, which is pretty cool in my opinion. 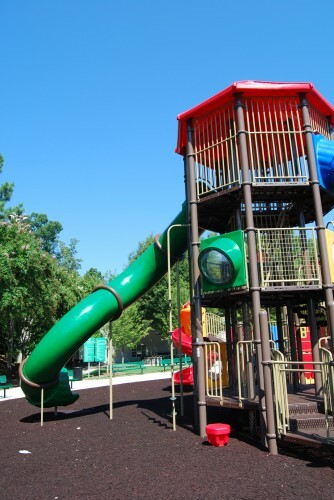 The main play structure is amazingly high – it’s fun to do something different than all the other playgrounds. It was a bit scary, though, to look up and see my 2 1/2 yr old coming down little climbing steps from probably 10 ft up in the air. I just wish all the new playgrounds weren’t built by cutting all the trees down first. It’s scorching out there in the summer – all the parents were huddled under the awning that’s over the picnic tables.